Don’t you just love how some recipes get all the flavor profiles going. Did you know that each part of your tongue is responsible for different flavor profiles? For example, the tip or end of your tongue is sensitive to sweet. The sides of your tongue are sensitive to sour. Salty profiles are noted at the tip and the front of the tongue. Whereas, bitter is usually noticed in the back of the tongue. This Wood Ear Mushroom Vegan Stir Fry recipe has it all going on. Including, one new flavor profile noted as umami. 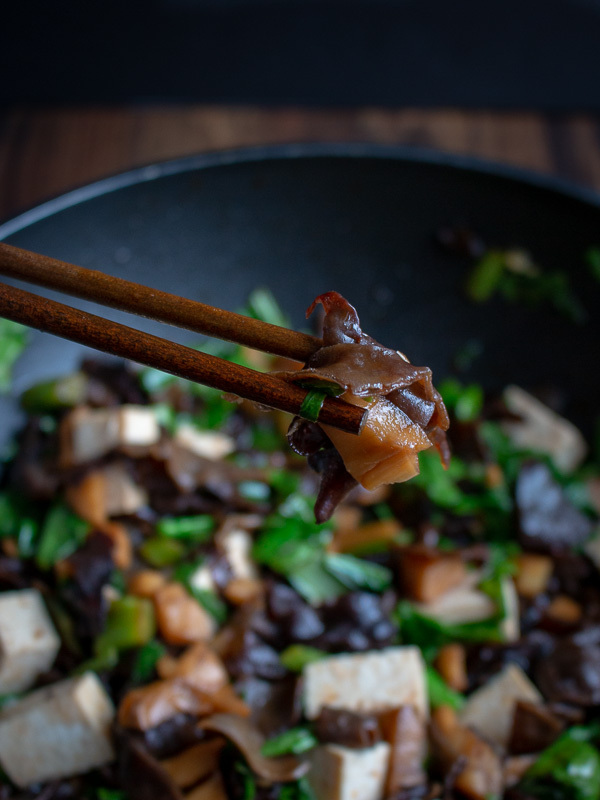 We just love the little dash of Chinese black vinegar in the sauce to give this Wood Ear Mushroom vegan stir fry recipe a little extra zing. These sour notes are sensed on the sides of the tongue. The saltiness from the soy (tamari) sauce in noted in the front area of your tongue. 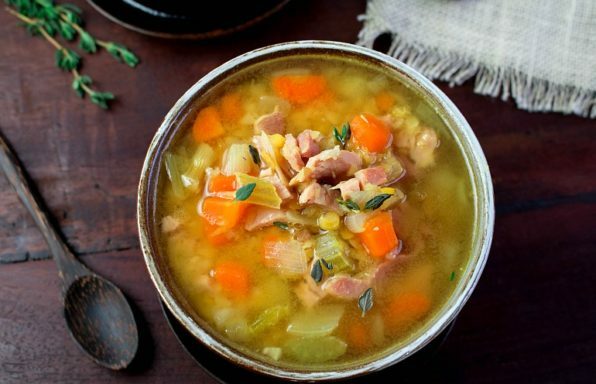 The natural sweetness from the vegetables in noted on the tip of the tongue. 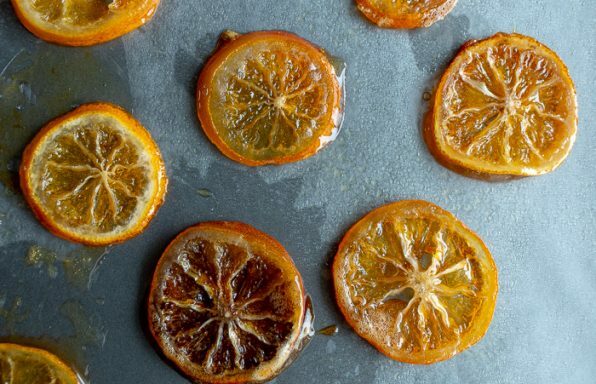 The spicy and umami essence of this recipe makes your whole mouth happy. You are just going to love that addictive little crunch of the wood ear mushrooms, the spice from the chili, the umami flavor from the garlic, ginger, green onion and earthy mushroom essence. 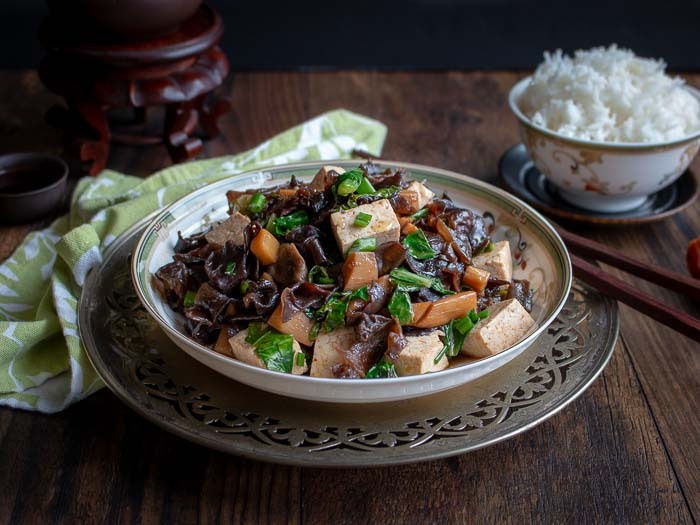 We bet you won’t be able to take just one helping of this delicious Wood Ear Mushroom Vegan Stir Fry. Honestly, it is just that good. Have you had a chance to check out our How to Prepare Wood Ear Mushrooms post? Be sure to check out How to Prepare Wood Ear Mushrooms before you try this recipe. 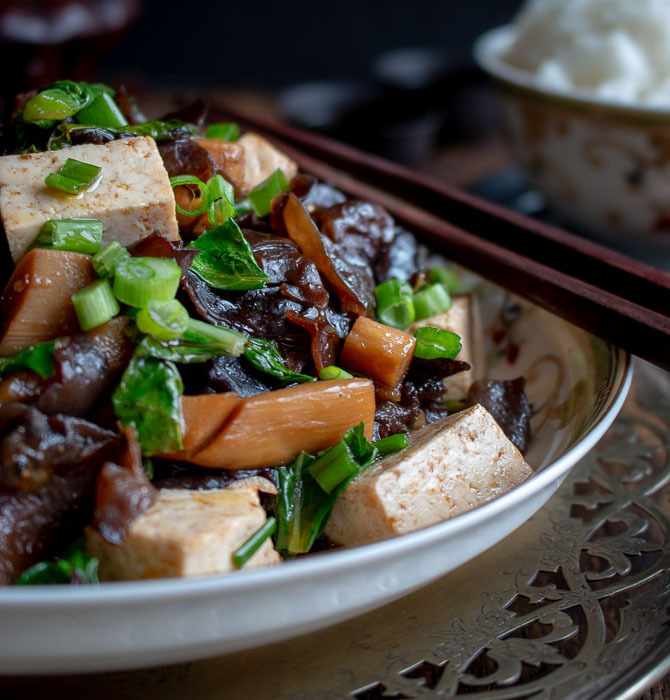 Rehydrating your wood ear mushrooms is one of the first steps to creating this delicious Wood Ear Mushroom Vegan Stir fry. Wood Ear mushrooms go by many names such as cloud mushrooms, pigs ear, Chinese Black fungus, Jews ear and many others. Chinese New Year (CNY) is right around the corner. It actually comes a little bit earlier this year too. In just 16 more short days., We have cleaning to get done, flowers market and gifts to prepare. This year it is the year of the PIG. If you are into Chinese Zodiacs, the year of the pig will be an interesting one for many. It’s time to get restocked at an Asian Grocery store to get all of our favorites. 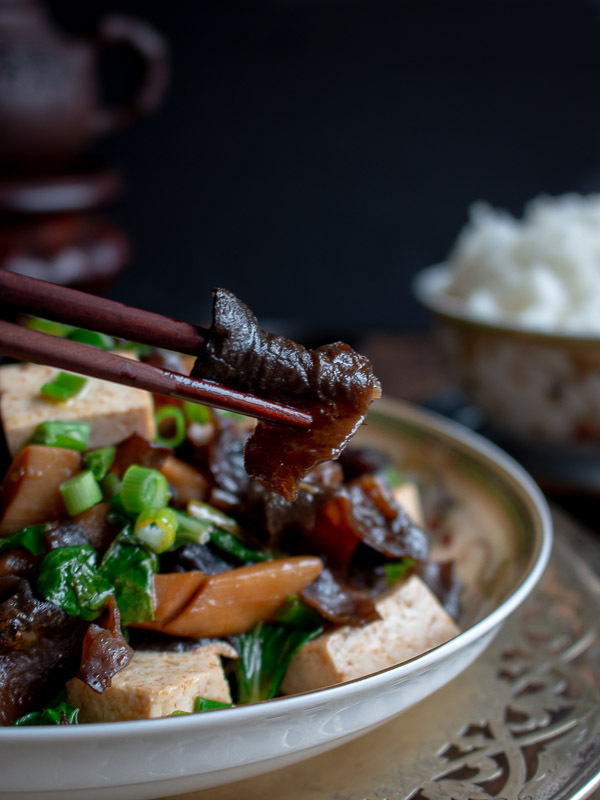 You are going to want to grab dried wood ear mushrooms and Chinese Black vinegar (Chinkiang) to make this recipe from the market. The other items such as bamboo shoots, sesame oil, garlic chili peppers, ginger, green onion, garlic, soy (Tamari) sauce and sesame oil are usually able to at a standard market depending on where you are living in the world. You may also be able to access these non - perishable items on Amazon. 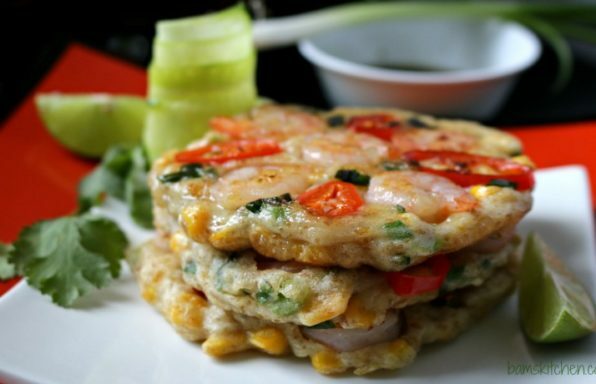 Do you have your Chinese New Year meals and snacks planned out? 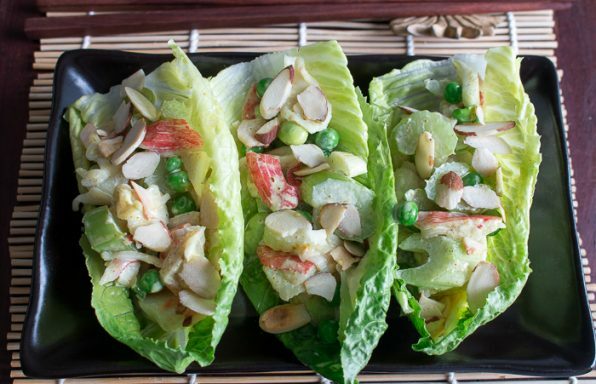 Check out our 10+ Fast and Easy Chinese Recipes for some inspiration. You are going to love our Spicy Beef and Longevity Noodles, Baked Chinese spring rolls, and make ahead Sweet Sticky Rice Chinese New Year Cake also known as nian gao. Really last year we made this epic discovery that you can make your nian gao cakes in advance, cut your nian gao cake into sections and freeze and when you want to use them just take them out for a few minutes, slice and pan fry with a little egg wash. Really delicious. "Nian" means Year and "Gao" means high so it is a good way to bring in a better, higher and more prosperous New Year. Chinese New Year, like any holiday always means gatherings will be centered around FOOD. Every nationality around the world has this same type of tradition. Don’t you think??? Grandmas around the world always are feeding their families. Usually all of your favorite treats. 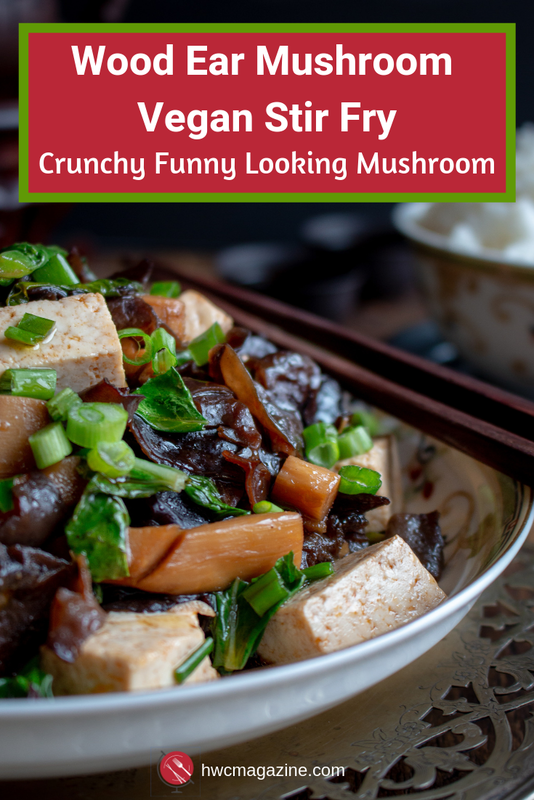 You are going to love this Wood Ear Mushroom Vegan Stir Fry as in less than 30 minutes to your table, vegan, nourishing, healthy and also fun crunchy texture on your palate. As we discussed in our last post, How to Prepare Wood Ear Mushrooms, wood ear mushrooms are cooling according to Traditional Chinese Medicine (TCM). It is best to counter balance this cooling effect with some warming spices like garlic, ginger, chili and onion to give the dish balance. Introducing the Five energies of Foods provides an over all review of foods as either neutral, warming or cooling. We used bamboo shoots and fresh choi sum to stir fry with but really the options for additions are endless. Take a look at your crisper and see what kind of vegetables you have around and use up all those bits and bobs. Our only suggestion is to stir fry the harder, thinly sliced root vegetables first and then followed by less harder vegetables. Add your leafy vegetables and prepared and chopped wood ear mushrooms at the very end and give them a quick toss. You do not want your wood ear mushrooms to lose that delicious crunch. This whole stir fry process in less than 5 minutes. Make sure you have everything chopped and ready to go as the wok will not wait. Do you have to cook stir fry dishes in a wok? Absolutely not. A frying pan will work just as well. However, the most important thing is not to overfill your frying vessel whether that is a wok or frying pan. 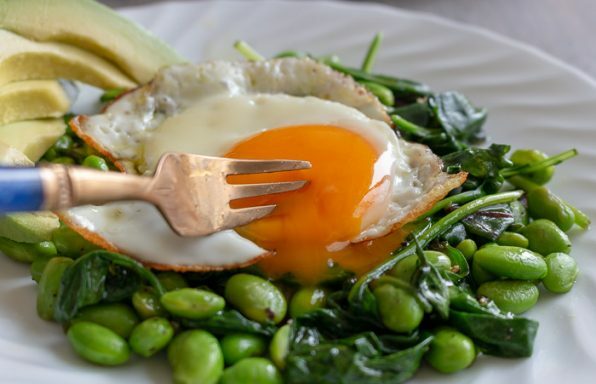 If your pan is too full, you are steaming and not quick frying and that is not the effect you are going for. Sometimes if you have a small wok or frying pan, you need to split the recipe into 2 batches. 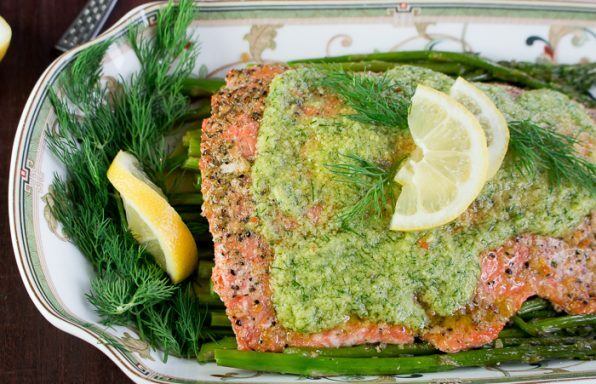 As it only takes 5 minutes to cook, that is just fine. 2Place oil in wok or frying pan, add in garlic, ginger and chili paste or chopped chili pepper and sauté for 1 minute or until spices are aromatic. 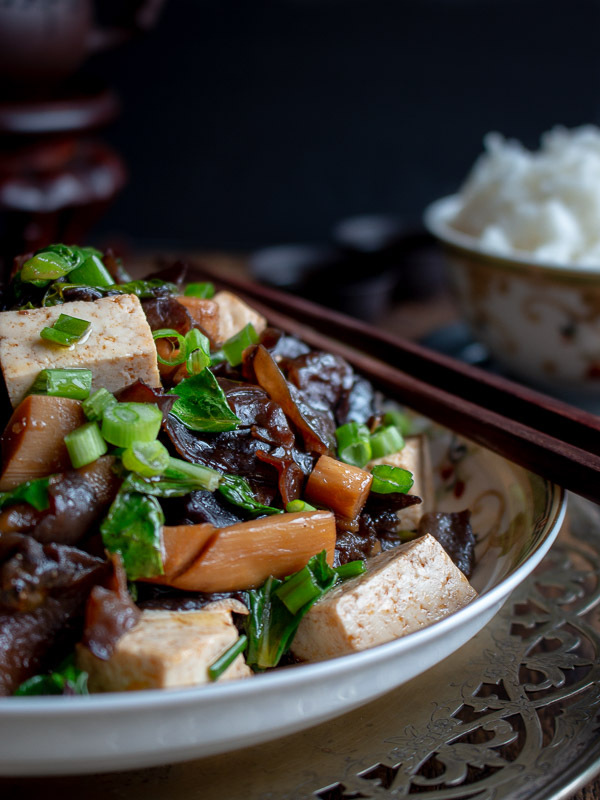 3Add bamboos shoots, wood ear mushrooms, tofu, choi sum (Chinese green leafy vegetable of choice), Tamari (soy), black Chinese vinegar, sugar or sugar alternative, sesame oil and stir fry until flavors are combined and your choi sum are bright green about 2-3 minutes. 4Top with green onions to garnish and serve hot with a side of rice. Enjoy!